Our previous couple of posts pertain to mounts Ebal and Gerizim, the setting of the curses and blessings of the law’s being read and accepted by all Israel as the basis of their receiving the land promise (Deut. 11:26-32; Deut. 27-28; Josh. 8:30-35). At the top of Gerizim there are archaeological ruins that date to the Persian and Hellenistic periods, as well as a Byzantine church. Mount Gerizim, view at top. Photo by Leon Mauldin. In distance at right you are seeing the tomb of a 12th century sheikh. The mountain in background is Mt. Ebal, the mount of cursing. Out of sight below in the valley between lies Shechem. In later times Mt. Gerizim would become sacred to the Samaritans, and still is today. In the intertestamental period there was a temple here, but it was destroyed by John Hyrcanus (Maccabean ruler) in 111-110 BC. When Jesus conversed with the woman at the well, she said, “Our fathers worshiped on this mountain” (John 4:20). She was speaking of Mount Gerizim, which was very much in sight of Jacob’s well, where they were talking. 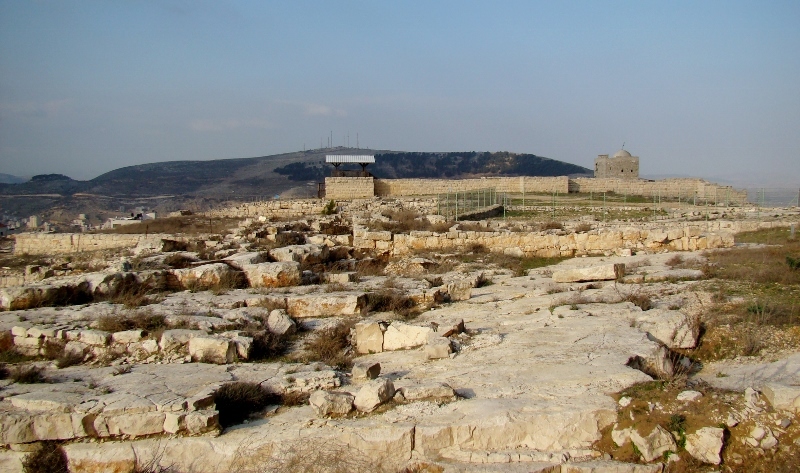 Todd Bolen has an interesting post on the acoustics of mounts Ebal and Gerizim here. See also Ferrell Jenkin’s post here. 33 All the people, rulers, leaders, and judges were standing on either side of the ark, in front of the Levitical priests who carried the ark of the covenant of the LORD. Both resident foreigners and native Israelites were there. Half the people stood in front of Mount Gerizim and the other half in front of Mount Ebal, as Moses the LORD’s servant had previously instructed to them to do for the formal blessing ceremony. 34 Then Joshua read aloud all the words of the law, including the blessings and the curses, just as they are written in the law scroll. 35 Joshua read aloud every commandment Moses had given before the whole assembly of Israel, including the women, children, and resident foreigners who lived among them (Josh. 8:33-35, NET). This entry was posted on Saturday, August 24th, 2013 at 11:19 AM and is filed under Bible History and Geography, Bible Study, Biblical Interpretation, Israel, New Testament, Old Testament, photography, Travel, Uncategorized. You can follow any responses to this entry through the RSS 2.0 feed. You can leave a response, or trackback from your own site.